Ben Phan’s grandparents came to Florida in the 1970s, part of the wave of refugees fleeing post-war Vietnam. They settled in Orlando and started a market, selling dry goods from back home to other immigrants from the Communist country. Orlando’s Vietnamese community continued to grow, as families sponsored more friends and relatives. Tien Hung Market grew along with it, expanding at its strip plaza location and adding seafood, meats, banh mi sandwiches, jewelry and more. Today, there are, by some estimates, nearly 30,000 people of Vietnamese descent living in Central Florida, the largest cluster in the state. The community’s cultural heart is Orlando’s Little Vietnam neighborhood, which radiates out from a busy intersection just northeast of downtown and includes dozens of restaurants, markets and shops owned by Vietnamese and other Asian-Americans. Tien Hung Market is in the center of the district, and Phan’s aunt owns Anh Hong, a restaurant next door. Though the market has been in business for three decades, its future was, until recently, very much in doubt. But the Phan family, which owns the store had always leased its space, struck a deal last year to buy the property from their landlord. The purchase convinced Ben Phan, the oldest of four siblings, to commit to the family business. It was obviously an important moment for the market. But it was also a significant step in the effort to preserve the character of Little Vietnam, one of the most distinctive corners of Orlando. Gentrification looms. Little Vietnam is in the midst of a rapidly redeveloping part of Orlando that local boosters have dubbed Mills 50 after the two busy roads that anchor it. It has become one of the trendiest spots in the city. Home prices are rising in the residential areas that surround it, and new businesses are opening every month — from independents like Lazy Moon, a popular spot for giant slices of vegan pizza, to national chains like 7-Eleven. Starbucks is rumored to be planning a store in the neighborhood. The market pressure is growing even as many of the small Vietnamese businesses — as well as Chinese and Korean and other businesses like Tien Hung Market that have also been established in the area over the years — are approaching periods of transition. It’s the same sort of problem facing other ethnic and cultural enclaves in the cities around Florida, where urban redevelopment threatens to wipe away the unique character of places like the warehouse district and Little San Juan neighborhood in Miami’s Wynwood and St. Petersburg’s Central Avenue. Little Vietnam is too young to qualify as a historic preservation district, and its architecture isn’t especially compelling, so there has been little impetus for the government to intervene. The neighborhood’s small-business owners have taken on the challenge of keeping the area’s distinctive character alive. Nguyen, the broker, says business owners in the area tend to look out for each other and try to ensure that commercial vacancies are filled by other small businesses, especially Asian-owned ones that can contribute to the tapestry. That has at times led to tension with the Mills 50 main street association, the non-profit that promotes the broader area. Some in Orlando’s Asian communities have complained in the past that the district hasn’t done enough to promote or protect the area’s ethnic identity. “Fourteen or 15 Asian businesses have opened in Mills 50 in the past years, so we do not consider gentrification to be an issue,” says Joanne Grant, executive director of Mills 50. In February, a Vietnamese-American doctor and real estate investor bought a large corner lot in Little Vietnam for $2.6 million. Nguyen, who represented the buyer, says he specifically targets properties in ethnic enclaves. 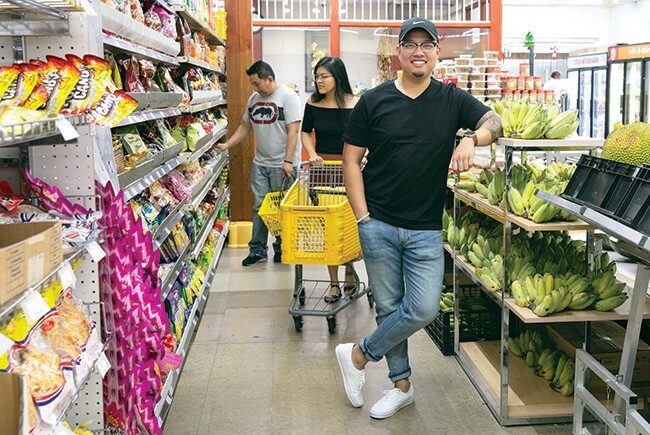 “Their goal is to ultimately make that corner — and whatever else they own in the area in the future — mimic, if not look even better than, other ethnic markets around the country,” Nguyen says. Still, Phan, of Tien Hung Market, says the continued “Americanization” of Little Vietnam is inevitable. And there are plenty of positives that come with that, he says. Phan points out that many of the newer Asian restaurants that have opened in the area are trendier, fusion-style concepts that are exposing more diners to Asian cuisines — diners who might then shop at a nearby market for Asian foods that they can cook at home. And the more businesses that open up in the area — whether they sell bao buns or blonde roasts — the more foot traffic there is for everyone else. Most of Tien Hung Market’s customers are still Vietnamese. But the store is seeing more non-Asian shoppers every day. Much of St. Petersburg’s 600 block along Central Avenue was to be razed for redevelopment until the real estate crash in 2008 stalled development plans. The city struck a deal with local property owners to offer leases in vacant storefronts to artists and shopkeepers at deeply discounted rates. Nearly two dozen galleries and other artistic businesses sprang up, giving the area new life. Rising rents, however, have forced out many of those businesses, making way for a more upscale crop of restaurants, bars and boutiques and prompting concerns that chain stores would enter the scene. A local artist last year staged a funeral for galleries lost to gentrification. Development pressure continues to rise: A Tampa Bay Times analysis last year found more than $500 million worth of construction underway or planned around St. Petersburg’s core. Redevelopment in Miami’s Wynwood neighborhood — where new office and apartment projects are opening this year, including the city’s first all micro-unit complex — is driving out some of the arts and entertainment businesses that made the area appealing in the first place. O Cinema Wynwood, Wynwood Yard and Electric Pickle, a decade-old dance club, will close this year as landlords sell property and raise rents. Escalating rents and property values are also fueling concerns of displacement in surrounding minority neighborhoods, including Little San Juan, Little Haiti and Liberty City. Just around a bend in the St. Johns River from downtown Jacksonville, the Brooklyn neighborhood was once a home for the Buffalo Soldiers, African- American regiments that fought after the Civil War. The opening of a pair of midsized apartment projects — 220 Riverside and Brooklyn Riverside — has turned the community into one of the city’s hotspots. Local boosters hope a publicly subsidized affordable and workforce housing apartment project planned by Vestcor Cos. will soften gentrification-driven displacement.